Ah, the glorious days of fall! Cool, crisp air wafts over our gardens and into our thoughts. Just as the world is winding down the garden year we start thinking about harvesting and using the herbs we have planted, weeded, watered, and murmured sweet nothings to during the summer. Lavender Scent Bags – A cloth bag filled with lavender can be used to scent drawers, closets, suitcases, or any other enclosed space. You can also use an envelope which can lay flat. Ask your children or grandchildren to decorate the envelope and it can become a gift for someone. Sleep Pillow – Lavender is a proven herbal relaxant. Take advantage of this and make a simple sleep pillow. Take a rectangular piece of cloth, fold it in half, and sew two sides closed. Fill loosely with lavender buds (so it will lay relatively flat) and sew the remaining side closed. Insert this sleep pillow between your regular bed pillow and the pillowcase, with the sleep pillow on the bottom. As you move around during the night the lavender aroma will be released to help you sleep soundly. Wedding Confetti – Many weddings sites have severely restricted what they will allow wedding guests to use as confetti to shower the departing couple. Lavender is bio-degradable and smells wonderful. Why not try using this instead of rice? Lavender Oat Bath Bag – Dry skin can be relieved by soaking in a warm oat bath. Why not add lavender to make it smell wonderful. Take a terry cloth washcloth and place two handfuls of oatmeal in the center. Add a few tablespoons of lavender or a half dozen drops of lavender oil. Gather the edges of the washcloth and secure with a rubber band or ribbon. Soak in a bathtub or foot bath of warm water. The oatmeal will leach into the water along with the lavender oil and help soothe the skin. 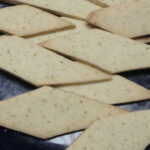 Lavender Shortbread – This is so easy to make! Just take your favorite shortbread recipe and add a tablespoon of lavender bud for every 2 cups of flour in the recipe. Before making the cookie batter, combine the sugar and lavender buds in a blender or food processor and process it until you can smell the lavender. This will break up the lavender buds and allow the lavender flavor to infuse the cookie dough. Make the cookies per the recipe instructions and serve with hot coffee or tea. I’ll end this post on lavender uses with a recipe from my cookbook. Preheat oven to 325°F. In a large mixing bowl, combine sugar, eggs, butter and beat at low speed until evenly blended. Stir in lemon yogurt and dried lavender. Add in remaining ingredients, increase speed to medium, and beat for 3 minutes. Pour batter into a greased Bundt or tube pan. Bake for 60 to 70 minutes. Let cake cool on a wire rack before inverting cake onto serving plate.